Pardon my long absence (uh, again). No excuses, but I’m back! As we are transitioning into a new season (which also happens to be my favorite season), I’m trying to rediscover some creativity in my kitchen. Does anyone else to find that as the long winter wears on, or as the spring showers rain down ceaselessly, that it becomes more difficult to come up with new ideas for dinner? A while back, the nice people at Corazonas sent me a selection of their tortilla chips to try, so I figured it would be a good excuse to cook up something other than roasted veggies for dinner. Generous, no? 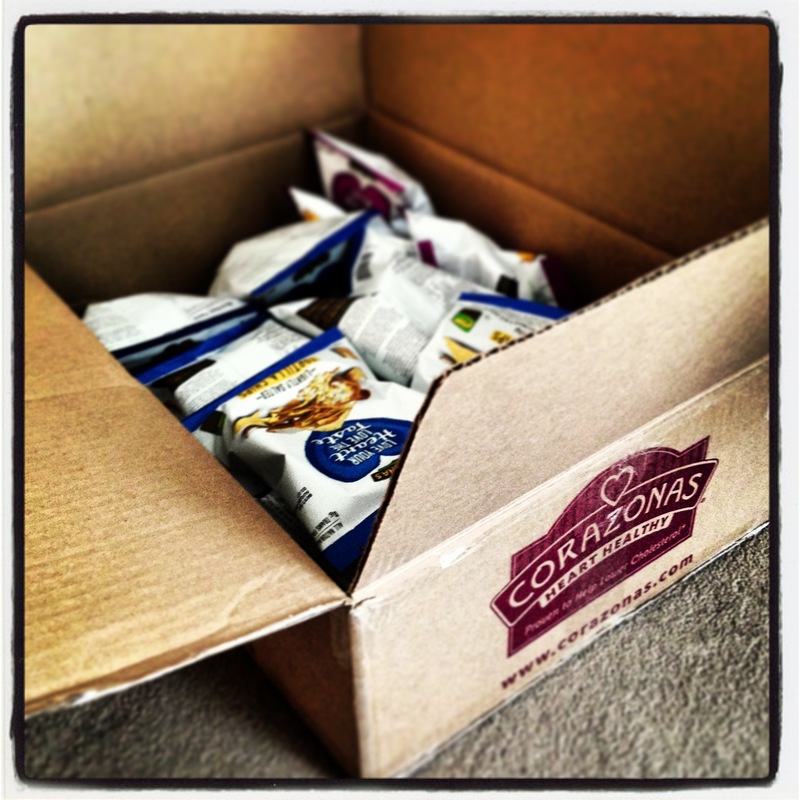 And considering how much I love tortilla chips – and Mexican food in general, let’s be honest – I accepted this box with open arms. 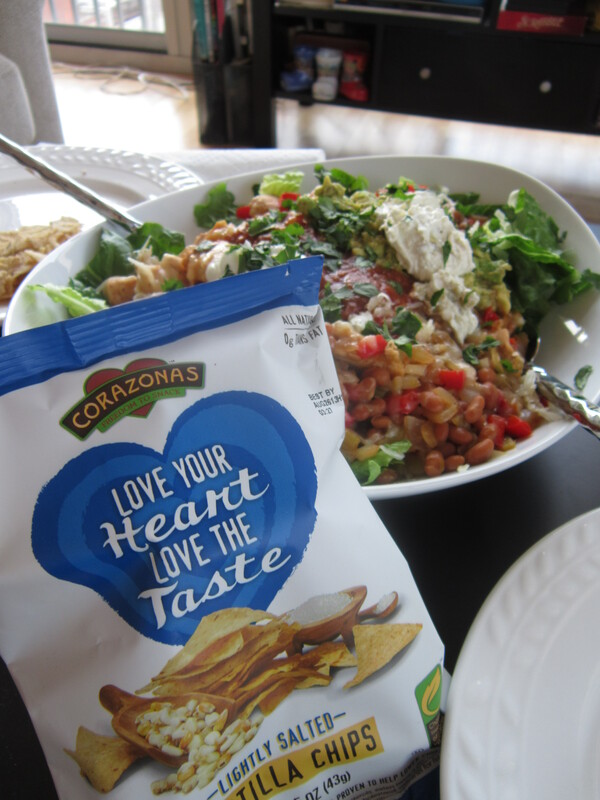 So here’s the deal: the Corazonas brand was created to provide healthier snacks, including Oatmeal Squares and these tortilla chips. The idea is that they infuse their foods with plant sterols, which they claim could help lower bad cholesterol. I figured that since the whole M.O. of the operation is to make healthier choices that I should probably pair them with something a bit less artery-clogging than cheesy enchiladas. 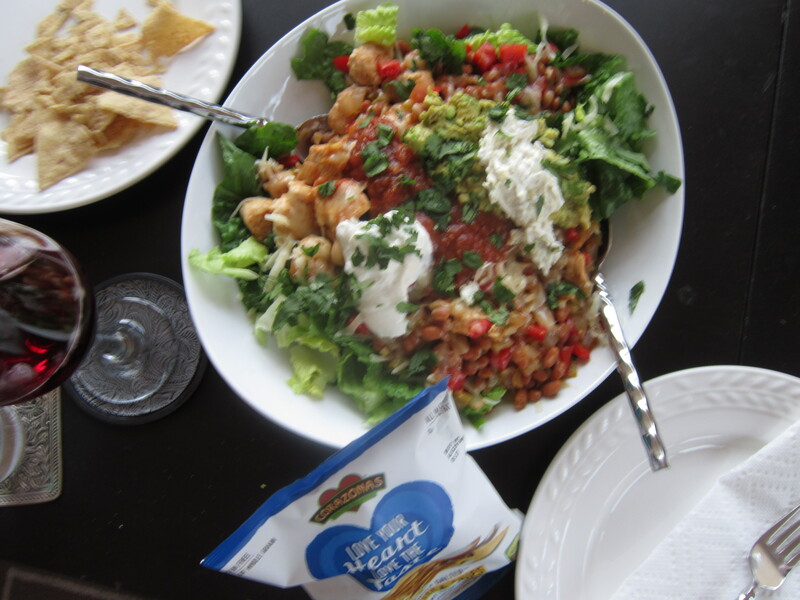 So, to make something fresh and even a little bit summery, I brought back (and then badly photographed) my good ol’ Yankee Taco Salad . You know, because it goes so well with tortilla chips. No, really, it does. Tortilla chips are to taco salads what croutons are to a Caesar salad. Put that in your SAT study guide. Analogies, woo! 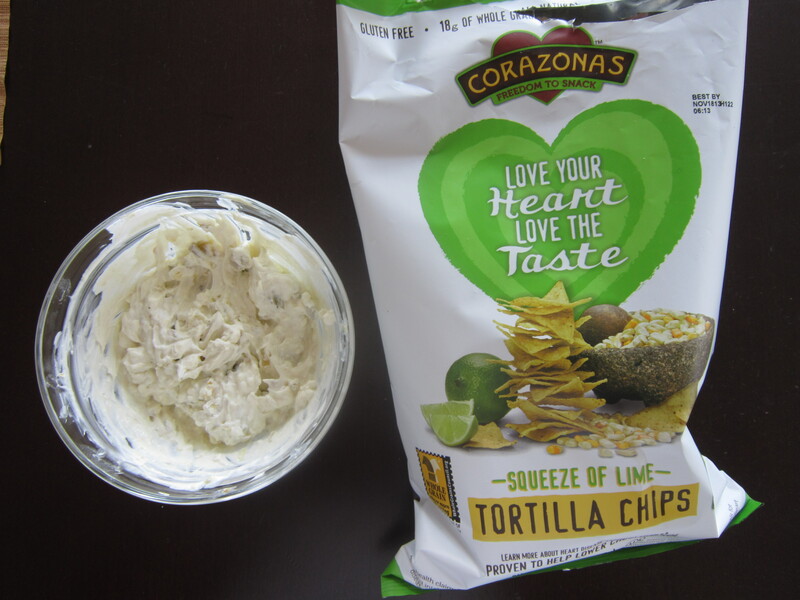 In addition to the plain salted variety, Corazonas also sent me some samples of their Squeeze of Lime (which I ate with a creamy green chili dip) and Black Bean and Cheese flavors. Of the three, I think the lime variety was my favorite, followed closely by the cheesy flavor (which reminded me a little bit of Doritos). I thought the plain variety had a bit of a greasy aftertaste, but I didn’t notice it in the flavored chips. The texture is great, though – light and thin, kind of like a restaurant style chip. Overall, I’d recommend them if you love tortilla chips and want to be a bit more health-conscious, but I think it’s worth noting that these are not light, fat-free or “diet” snacks, and portion size should still be taken into consideration. Plus, I’m not sure how much research has been done on plant sterols (there could be quite a bit, I’m just not an expert), so I wouldn’t consider these to be a real “health food”. *Obligatory disclaimer: This product was provided to me at no cost, but opinions are my own. Also, I am not a medical professional, so take anything and everything I say with a grain of salt. Now, in case you missed the memo, the first official day of summer is THIS Friday, so I highly recommend that you dust off your grills, carry a watermelon, stock up sweet tea vodka (what, that’s totally a summer drink) and make a salad in preparation. And don’t forget the chips with your salad. Glad you’re back! The chips look yummy. I think we used to sell those when I worked at Jamba back in the day and I remember liking them. The taco salad looks delicious as well. YUM! Lime chips can do no wrong.